Bubble Jewelry - This is a handcrafted beautiful sterling silver pendant that that features a freeform red Coral. This showy statement One-of-a-Kind necklace comes with an 18" snake chain. 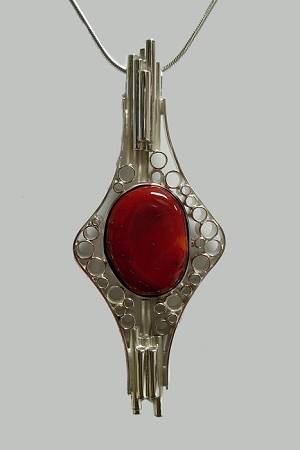 This Sterling Silver pendant is hand created using round silver tubing cut and soldered to frame a freeform coral which is fully bezeled in silver. The coral measures approximately 25 x 20 mm. The pendant comes with an 18'' Sterling Silver snake chain. Designed, signed, and hand made by Aaron Rubinstein and Modern Art Jewelry .